Provider is also used in our decorators (e.g. @NgModule). It seems wrong that it is now defined in a file called reflective_injector_interfaces. I think it should be defined in e.g. di/metadata.ts and then this file can reexport it if we really need this file. I can't use .useValue since the value could be undefined. So since I started using in with useValue, I am just being consistent. Why use an object hash and not a Map directly? I think using a Map is simpler, and shouldn't be slower AFAIK. This won't work if users run in real ES6 mode. Consider doing a obj = new fn(...deps). Consider passing the tokenPathOnError directly to tryResolveToken, so you don't need to patch it unto the error (as it is a private field anyways). I mean you can just create it as an empty array, and only fill it in case of an error in the various catch clauses. This way, the cost is only to create the empty array, but not to fill it. Maybe have separate const statements to clear up the formatting? Did you check if this prints nicely in the browser console? AFAIK it does not. Yes, it looks good in console. Not sure I understand. It is present. Ah, never mind, I remembered incorrectly how the guides work. Looks good in general, needs cleanup. Never mind, I think it is actually good to change benchpress as well. Would #13820 be affected by this? 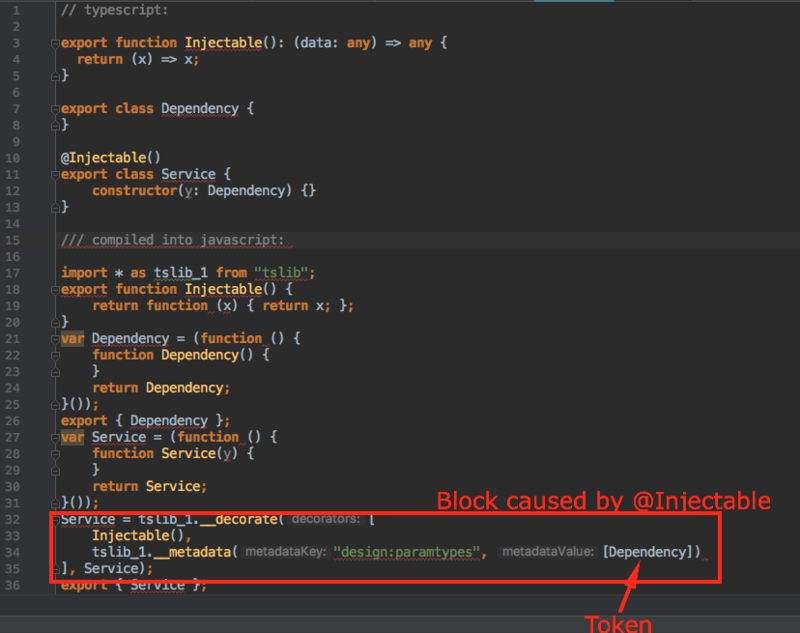 Seems StaticInjector does not require @Injectable() anymore. @Injectable() is just a trick to get typescript to export the typings from the constructor, thanks to emitDecoratorMetadata setting in tsconfig.json. It'll most likley stay. @sod #13820 is about requiring @Injectable() when there is no dependency, where metadata is not needed here. Commit message fcadbf4 reads like you are indeed right. They deprecated or even got rid of the reflective resolver altogether.